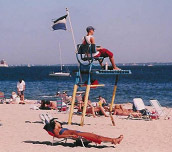 Open the Saturday of Memorial Day weekend through Labor Day, Ocean Beach Park is open and operated daily. 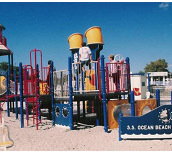 Ocean Beach Park offers fun and entertainment for the entire family throughout the week. The Park is also notorious for hosting family-oriented events throughout the summer season. Stay up to date with our Calendar and Contact information. • Pay tribute to a special person. • Memorialize a loved one. • Engrave your family name. • All proceeds go directly toward boardwalk refurbishment expenses. While you are at Ocean Beach Park, you have an opportunity to schedule your work out. Our state of the art health club, Renegade Fitness offers single day memberships for your convenience. Click here to learn more about Renegade. Every Monday evening, Classic Hits 98.7 WNLC sponsors Ocean Beach Park’s “Cruise Night” show Enjoy a parade of antique cars and other interesting vehicles and the sounds of a Live DJ spinning classic music. Parking and admission is free. There are ride wrist band specials, as well as waterslide and mini golf specials as well. Every Tuesday evening enjoy a movie in the open night air from the comfort of your beach blanket. Bring the entire family to a movie for free. There is no charge for the movies, but if you park in our parking lot, you are subject to our normal parking charge. Click here for the latest movie schedule at info@ocean-beach-park.com. Ocean Beach is proud to present Boardwalk Magic, a great Magic Show the whole family can enjoy. Experience the entertainment on the beautiful beach setting. Check out our all new Ocean Beach Park Trivia Night new in 2018! Relax with a cold refreshment and heat up with live music on the boardwalk stage. From atop the deck of the Sandbar Lounge relax and listen to live music at the beach setting. Enjoy Chef Joe’s newest delicious creations at Southeastern Connecticut’s favorite outdoor café. © 2017 Ocean Beach Park.